This one is quite different in both dimensions and texture from the Twisted Tree cardigan I finished a few weeks ago. 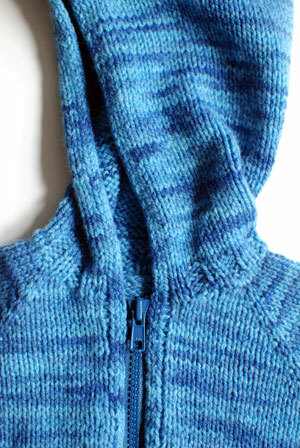 Pattern: #982 Babies Neck Down Cardigan from Knitting Pure & Simple. I knit the middle size – 12 months. Not too many noteworthy modifications. As usual, I knit 2X2 ribbing instead of 1X1, because I strongly prefer the way 2X2 ribbing looks. I also didn’t work the garter stitch edging on the hood, nor the buttonbands. 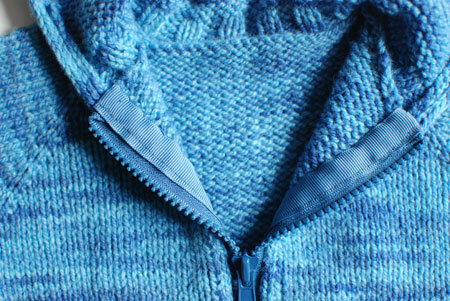 Instead, I knit a continuous i-cord around the entire cardigan opening. Yarn: Hand-dyed 70% cormo wool/30% nylon blend yarn from Foxhill Farm. I bought two skeins of this yarn a year ago at the Massachusetts Sheep & Woolcraft Fair. Even though both skeins were marked to be the same dye lot, I could tell that one skein had much more indigo in it than the other. So, from the very beginning, I alternated the skeins every two rows. I used a total of 132 grams of yarn, or about 400 yards to knit this sweater. This is a little bit less than what the pattern specifies. This yarn has some kind of magic properties. It is very soft in the skein, but becomes even softer and more terrycloth-like after washing. It also blocks fantastically – all stitches even out, the fabric becomes nice and smooth and squishy. I’m glad I have enough left over for another little project! Needles: US 6 and US 7 circs. Using the larger needles, my gauge was about 5 stitches and 7 rows per inch. Finished dimensions: about 21.5″ chest circumference, 7.75″ sleeve length to underarm, 11.75″ shoulder to hem. Not as long and skinny as the green zippered cardi. The zipper came together as before. I once again fully lined the back, to protect the baby from any chafing and prevent snags. Someone asked last time whether the line of stitches closest to the zipper teeth is machine-stitched or hand-stitched. Of course it’s machine-stitched! My hand stitching is not that perfect ;). That line of stitches is where I sew the grosgrain ribbon to the zipper tape. After those two are sewn together, I hand sew the now-lined zipper into the knitted fabric. This is gorgeous! 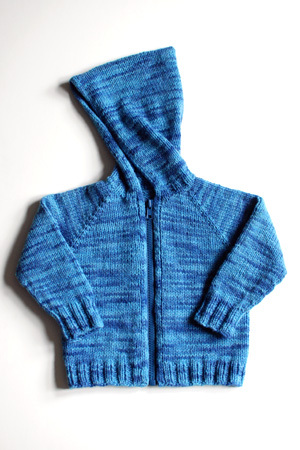 I want to make this exact cardigan for my son but 1) He’s nearly seven and 2) I’m completely intimidated by the zipper. Your work is so polished! I love the KP&S patterns and made this cardigan for many a wee one but none as well finished as yours. Makes me want to try adding a zipper next time. I think I might make one that will await the next newborn in my circle of friends! Thanks for the inspiration. Your little cardi is absolutely gorgeous! It is exactly what I had in my head when I got the crazy idea to knit similar hoodies for a co-worker who was having triplets. Mine (one in shades of blues, one in pinks, and the third in purples)were not anywhere as beautifully constructed as yours. But they were done and delivered before the babies turned three months. Hoorah for small accomplishments. I only wish mine were executed as beautifully as yours. What a great sweater! And love those hoodies. No more missing hats! Lovely little blue hoodie! I looove it! This is so wonderfully cool. Such a versatile piece! Beautiful hoodie; very useful for layering babes. Congrats and good luck on you impending addition.